Stephanie has been waiting for several long months for the right Grey. Cairo finally arrived! A beautiful sweet boy who loves to relax next to you and just take everything in. Stephanie is so excited to have a new buddy at home! Katharine is over the moon (and Cloud) for her sweet shy boy, Queso. Queso will enjoy the quiet life walking around a quiet neighborhood and keeping Katharine company when she works at home. Kristen and Zach were so happy to meet their gorgeous brindle boy, Remy. Remy is very curious. From what we heard, Remy has already taken over their home and their hearts. Rocket can sure go....right into the hearts of Hannah and George! It was almost immediate as he followed George and Hannah from the moment they saw him. 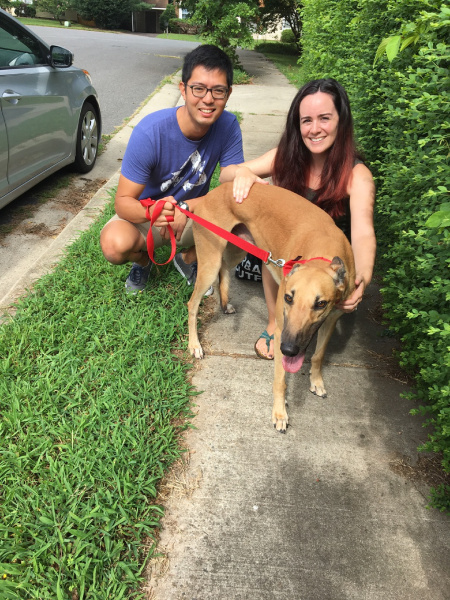 Rocket will be enjoying walks in the city and much relaxing rest time at home with his new family.